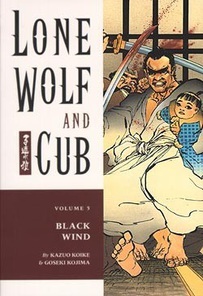 This volume contains five powerful, classic tales of the assassin Itto Ogami, the Lone Wolf, as he continues his journey. The Yagyu clan, fearful of the growing legend surrounding Lone Wolf, has decided to protect itself by sending its own assassin after him, and later pit the greatest swordsman of a rival clan against him. Also, Lone Wolf must face the leader of a bounty-hunting gang who seeks revenge against Ogami for slaying his young lord years ago, and a master gunsmith who values the art of warfare above all else and will change his life forever.